I’ll let you in on a secret. I used to think that I don’t like okra. The only way I’d had it was deep fried with a corn meal breading. It was ok if it was well done and really fresh, but nothing to write home about. 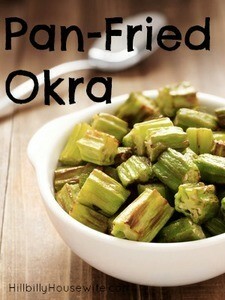 I’d never touches okra in any other way shape or form. I didn’t grow up with it and my husband described it as gross and slimy. I never gave this southern staple a chance. A few weeks ago my friend Nikki totally changed all that for me. We went over for a barbecue at her house and she had roasted some Okra from her garden in some olive oil and salt. They were the most delicious little appetizer/snack. We munched on them while the boys grilled the meat. When I went to the farmers market on Wednesday, I picked up a basked of red okra and talked to the lady at the stand about cooking them. She recommended sauteing them with a little salt and pepper. I decided to play around with it a little bit and came up with my own 3 ingredient recipe. It’s super simple and comes together in a flash. Slice the okra into bite-sized chunks (discarding the tops). If you’re in a hurry, cut them into smaller chunks. Heat some coconut oil in a large skillet over medium heat. Add the sliced okra to the pan and let it cook. Occasionally move them around in the pan until they are soft and start to brown a bit on the edges. I didn’t give any measurements in the recipe on purpose. Cut up about 2 medium sized okra pods per person. Use enough coconut oil to cover the bottom of the pan. If the Okra starts to stick to the skillet, add a little more. Season with salt to taste.